Warranty range from lifetime to 1 year (depends on product). Warranty can be extended. NordicTrack launched in 1975 and became known for their cross-country ski exercise machines thanks to the TV commercials. By the 1990's NordicTrack has branched out to include other home fitness equipment like treadmills and stationary bikes. Today NordicTrack manufactures some of the most popular models of treadmills, incline trainers and ellipticals. They also have come out with innovative low impact exercise products like the FreeStrider which is 3 machines in 1, a treadmill, elliptical, and stepper. Plus many NordicTrack machines include the latest technology like touch screens and iFit at affordable prices. iFit is a fitness app that integrates with most of NordicTrack fitness machines. This integration is either built in or can be added by purchasing an additional module which is then controlled by your smartphone or tablet. What iFit does is it allows the app to control the resistance, incline, and speed (depends on machine type). With this functionality along with Google Maps training routes (terrain simulator) you can workout anywhere in the world. Thanks to Google street view and special videos taken you can also train on famous courses like the Boston Marathon. iFit also offers professional workouts designed by celebrity trainers like Jillian Michaels. iFit tracks your progress and logs all of your workouts for up to 3 accounts. They also offer workout challenges which is a fun way to compete with the iFit community and get some exercise at the same time. NordicTracks most popular series of treadmills include the Commercial Series which is designed to be sturdy and reliable, the Incline Trainers with an incredible 40% incline, and the C Series of Treadmills designed with the latest technology and with space savings in mind (foldable). This whisper quiet designed treadmill sports a 7" web-enabled touchscreen (iFit enabled) along with a tablet holder. Built in speakers also allow you to play music from your mp3 player. The Commercial 1750 comes with a 3.8 continuous horse power motor that are cooled by 2 fans making sure it lasts a lifetime. The motor runs a 22" wide by 60" long 2-ply tread belt on 2.5" rollers that can reach speeds of 12 mph. The ramp for the Commercial 1750 can also incline or decline with a push of a button from -3 to 15%. The foot print of the entire treadmill is 61" long by 34" wide and 72.25" high. When not in use this treadmill folds up using the easy lift system saving a lot of floor space. The current price for the Commercial 1750 Treadmill is $1,499.99 with shipping. The Commercial 2950 is an upgrade of the Commercial 1750 Treadmill. A heavier duty motor is included which is rated at 4.25 continuous horsepower. You also have a larger 10" touchscreen and 40 built-in workout programs. The console has 3 built-in fans to help cool you down as you workout. The Commercial 2950 also comes with power adjustable height for the console which is ideal for a treadmill with multiple users. This way the display, heart rate sensors, and controls are all at a comfortable position when working out. The current price for the Commercial 2950 Treadmill is $1,999.99 with shipping. The X7i Incline Trainer is a special type of treadmill. It has an incredible 40% incline (when most treadmills max out at 15%) and a -3% decline. This is a very steep incline that is great for walking and burning those calories. At 40% incline you can expect to burn 5 times more calories when compared to walking at the same speed and at the same time at only 6% incline. The X7i comes with a 2.75 CHP motor that reaches speeds of 12 mph. This Incline Trainer supports a long stride with it's 60" tread belt and it includes reflex cushioning which helps absorbs impact and reduces stress on your body's joints. As with NordicTracks other treadmills the X7i includes a heart rate sensor and comes with a adjustable table holder. The 7 inch display is backlit and you can also plug your iPod into the integrated sound system. The current price for the X7i Incline Trainer is $1,599 and it includes free shipping. Like the X7i, the X9i has a 40% incline but an improved -6% decline. The upgraded X9i Incline Trainer includes a larger motor (3.0 CHP) and has a slightly stronger frame which has a weight capacity of 350 lb (25 lbs more than the X7i). The screen is the same size at 7" but it is color and touch enabled. You also can surf the web and use iFit directly on the X9i instead of through your own tablet. The console also includes more workout programs than the cheaper model. The price for the X9i Incline Trainer is $1,999.99 and includes free shipping if you pay by credit card. The C series of treadmills is NordicTrack's economical options for fitness enthusiasts who want a quality durable product but at a cheaper price. The C 990 Treadmill comes with a 3 continuous horsepower motor that reaches speeds of 12 mph which is ideal for walking and running. The 20" wide by 60" long tread belt can incline from 0 to 12% at a touch of a button. The ramp also folds up to the console which is ideal for people who need to save space. The console of the C990 contains a 7" full color touchscreen. There are 32 built-in workout programs and it does come with iFit which means you can download and create your own workouts. The console has quick touch controls that allow you to press one button to reach whatever speed or incline you want. A built-in fan will also keep you cool and senors in the grips will monitor your heart rate. The price for the C 990 Treadmill is $999 and has free shipping. The C 1650 Treadmill is a good upgrade for just $200 when compared to the C 990. It comes with a 3.5 horsepower motor and a longer warranty on all parts and labor. Max weight capacity has also increased to 325 lb thanks to a better frame and the console includes a much larger 10" color touchscreen. You also get a couple more workout programs that are built in (34 in total). The price for the C 1650 Treadmill is $1,299 and includes free shipping. NordicTrack has several different types of ellipticals. They have front drive, rear drive, and center drive ellipticals. The front drive system is the most common while the center drive system like the A.C.T. Commercial Series is the most compact and the newest type. The rear drive ellipticals take up the most space but some people like them the best since the stride can feel more natural. Some rear drive ellipticals can be folded for easier storage. Ellipticals are a popular type of fitness equipment thanks to how they are designed to reduce impact on joints like knees and hips while still giving a full body workout. The NordicTrack C 7.5 Elliptical has a front drive 20 lb flywheel which offers 22 digital resistance levels. The stride of the C 7.5 is power adjustable at a maximum of 20". The ramp incline is also power adjustable from 0 to 20 degrees. The console of the C 7.5 elliptical comes with a 5" backlit display which shows the progress of your workouts. It also contains 26 pre-programmed workouts and it comes iFit enabled via Bluetooth to your Android and iOS tablet. A fan is also built into the console along with a speaker system for your mp3 player. The EKG heart rate sensors are integrated into the grips of the handles. The price for the C 7.5 Elliptical is $799 and includes shipping. The NordicTrack C 12.9 Elliptical has all of the features of the C 7.5 and a few upgrades as well. This front drive elliptical has a heavier 32 lb effective flywheel which has 26 magnetic resistance levels. The heavier duty frame of this elliptical (which it shares with the Commercial 14.9) is also engineered for a person with a maximum weight of 350 lbs and comes with overall a longer warranty. The console on this elliptical received an upgrade as well. It includes a 7" color touch screen which allows you to use the built-in iFit along with browsing the web over WIFI. The C 12.9 also includes 35 workout apps, a wireless chest strap, and water bottle holder. This elliptical also ships with out-of-the-box easy assembly, which means it just take minutes to setup and workout. The new price for the C 12.9 Elliptical is $1,299 with shipping. The NordicTrack Commercial 14.9 Elliptical is an upgraded version of the C 12.9. It comes with a larger 10" web-enabled color touchscreen and a longer 6 year parts and 3 years labor warranty. The current price for the Commercial 14.9 Elliptical is $1,499 with free shipping. The NordicTrack A.C.T. Commercial 10 is a new type of elliptical. With it's space savings design and stability thanks to the centrally located 25 lb flywheel this elliptical allows the user to manually adjust the stride from 18" to 22". This is easy to do and just requires a turn of a knob. With a max user weight of 350 lbs and 24 resistance levels you can workout with one of the 35 pre-programmed workouts or log into iFit and make your own workout. The A.C.T. Commercial 10 comes with built in heart rate sensors in the grips along with a wireless chest strap that are quick reading and helps you stay in your target burn zone for calories. The touchscreen on this elliptical is large at 10" and is in full color. It also can be used to surf the web on and watch TV. If you want you can also use the built in speakers to listen to music from a mp3 player. The current price for the A.C.T. Commercial 10 Elliptical is $1,499 and it includes free shipping. The NordicTrack SpaceSaver SE7i is a rear drive elliptical that can fold and be stored upright to save a lot of space. This fitness machine also comes almost completely assembled which means it is ready in minutes for you to use the first time. The SpaceSaver SE7i has a 18" stride and uses a 18 lb flywheel. It offers 22 digital resistance levels and has a power adjustable include that offers a range from 0 to 7 degrees. Included on the handle bars are heart rate sensors and the console has a 5" backlit display. For an additional cost you can also buy an iFit module which will allow the iFit app to control your elliptical via Bluetooth technology. The current price for the SpaceSaver SE7i Elliptical is $1,499 and it comes with free shipping. The NordicTrack FreeStride Trainer FS5i is a different type of fitness machine. It closest cousin is the elliptical but it shares the benefits and motions of a treadmill and a stepper. Unlike an elliptical which runs on rails the FreeStride Trainer uses belts which are attached to a crank. With this setup you are able to adjust the stride of the FreeStride as you workout just by altering your own stride allowing you to go from a really short step type stride to one that is up to 32 inches long. The FreeStride has a center drive 16 lb flywheel which has 22 resistance levels. The console has a 7" backlit display and it supports iFit via a module which is sold separately. It also has 32 built-in fitness programs giving you a range of options for speed and intensity type workouts. As with other NordicTrack machines, a port to plugin your mp3 player is also included so you can play music through the integrated speakers. The current price for the FreeStride Trainer FS5i is $1,499 with free shipping. NordicTrack makes several different types of indoor stationary bikes. This includes upright exercise bikes along with recumbent bikes which you sit in a seat with a back rest. Recumbent bikes are less stressful on your bikes since they put less pressure on joints. The GX 3.5 Sport exercise bike is new for 2016 and provides a realistic cycling experience and an excellent cardio workout at a low price point. It comes with a front drive 40 lb effective flywheel and chain drive system. Turning a knob allows you to modify the resistance of pedalling which uses a natural wool felt system and manual pressure. The whole resistance and pedalling system is quiet and smooth and includes a brake which allows you to quickly stop your workout. The pedals come with toe cages and straps and the seat can be moved in 4 directions to allow for the best location for you of the saddle. The bike frame is welded steel and has a built in water bottle holder. The backlit LCD screen is easy to read and it keeps track of your time, speed, and watts produced. The current price for the GX 3.5 Sport is $399 and has free shipping. The Commercial VR25 Elite is a brand new model by NordicTrack. This recumbent exercise bike offers full back support thanks to the extra wide pedals placed up front and a cushioned backrest and seat. The chair like seat with built-in lumbar support is designed to protect your lower back from strain. The seat itself is set on a rail which offers easy glide adjustments and eliminates the horizontal bar in traditional designs allowing users to easily sit down and start pedalling right away. The VR25 Elite has a 25 lb flywheel with 26 resistance levels. The console includes a 7" web-enabled color touchscreen and has iFit built in. It also has 35 programmed workouts you can choose from. Controls are available on the console itself and the side stability handles. The handles also include the heart rate sensors which helps keep you on track of your target calorie burn area or you can wear the included Bluetooth smart chest strap. The price for the Commercial VR25 Elite is $999 and includes free shipping. The Grand Tour Pro upright exercise bike is NordicTrack's premier model. The Grand Tour Pro has a 10 degree power adjustable incline and 10 degree decline as well. The exercise pedals has adjustable straps for any size feet and there are 26 resistance levels to simulate different conditions and intensities. The console has a 10" color touchscreen which also allows you to surf the web. You are also able to connect with iFit and pedal anywhere worldwide thanks to Google Maps and Street View. This bike also comes with 2 5 lb dumbbells as well to help with upper body strength while you cycle. The current price for the Grand Tour Pro is $1,499 and includes shipping for free. Using a rower for a workout targets your upper, lower and core body. The machines are compact, light and easy to use. The faster you use a rower, the greater the resistance is generated, which increases calories burned. NordicTrack sells only one model of rower, the RW200. The max user weight for this foldable rower is 250 lbs. The large padded seat is adjustable and sits on a steel rail. The pedals with straps are over sized and pivot and are ideal for any body height. The inertia enhanced flywheel uses fan blades to create air resistance which increases the faster you row. The backlit LCD console displays Watts generated, time, distance, calories and strokes. It can also be physically adjusted to change the viewing angle. The console comes with 20 preprogrammed workouts and built-in speakers which you can use with your mp3 player. The current price for the RW200 Rower is $599 and it comes with free shipping. NordicTracks first fitness machine was the Nordic Track Ski Machine which replicates cross country skiing and it is still a favorite today thanks to being one of the best cardiovascular workouts. The natural motion of your arms and legs offers a great exercise without any discomfort. Independent resistance adjustment of each allows you to train your arms at a different level than your legs. The NordicTrack Classic Pro Skier flywheel has 7 resistance levels and manual adjustable elevation which will increase the intensity even further. You can also independently adjust the resistance for your legs and arms. The console has 5 LED displays which shows your distance, pulse, time, and calories burned during your workout. The current price for the Classic Pro Skier is $599 and includes shipping for free. 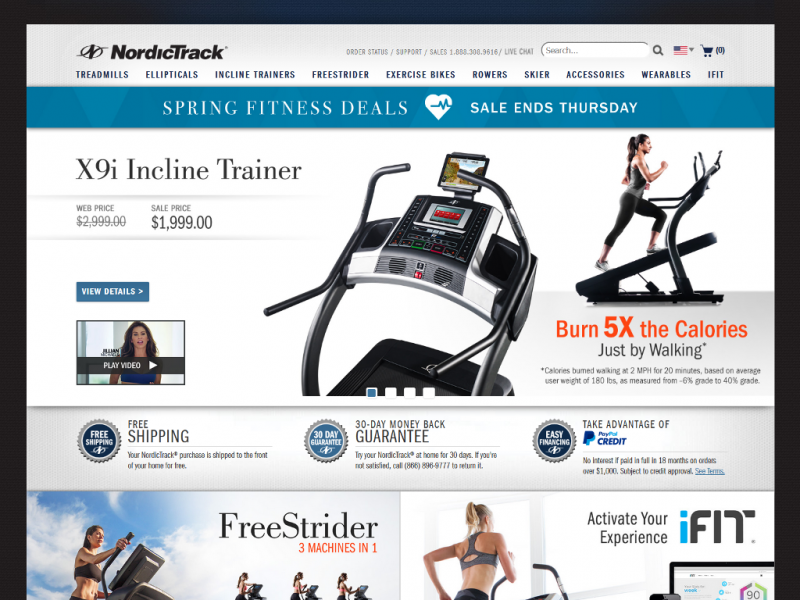 All NordicTrack fitness machines come with a trial 30 day money back guarantee once you receive your purchase. On defective machines you will receive a full refund or replacement, on returned working exercise equipment you will receive a full refund minus a 10% restocking fee and the cost of return shipping. To start a return process you must call NordicTrack customer service phone number. Warranties do differ depending on the NordicTrack model. Most of NordicTrack's fitness equipment comes with a lifetime frame warranty (for original owner only). Motor warranties vary from 25 years to lifetime and usually depends on the horse power the motor offers. NordicTrack parts will have a minimum warranty of 1 year to a max of 5 years. Likewise labor varies from 1 to 3 years. NordicTrack also allows you to purchase extended warranties and maintenance service plans on most models. NordicTrack has a customer service website where you can register your product, download digital copies of manuals and order parts if needed. They also have a self help section which lists articles and videos created to help you with the most common problems (ordered by categories). There is also a FAQ section which has short answers to quick problems. NordicTrack customer service representatives can be reached by a toll free phone number, email, online submission form, and online chat during business hours.